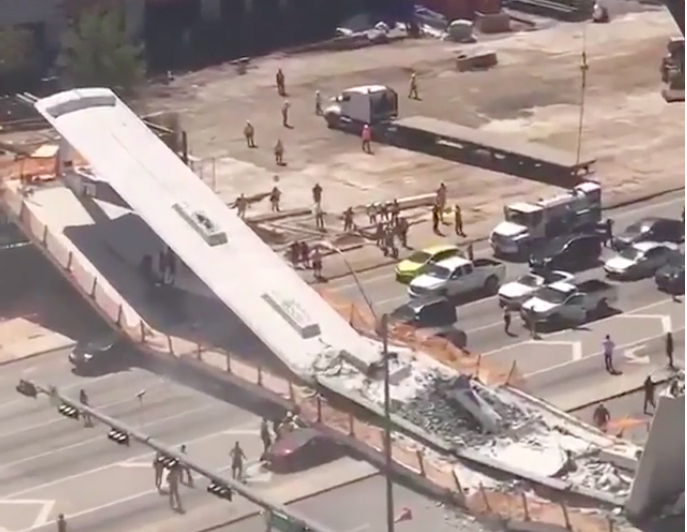 When a newly minted pedestrian bridge fell onto unsuspecting traffic on a busy Miami street Thursday afternoon, killing six people, an off-duty police officer who witnessed the deadly event jumped into action. Sgt. Dave Gland was one of the first responders who arrived to the scene within seconds of the collapse of the bridge, which stretched above Miami’s Southwest 8th Avenue. After seeing the accident from the business he owns across the street, Gland spent 15 minutes working to keep an injured victim alive, Sweetwater Mayor Orlando Lopez said in a press conference Thursday. Gland’s wife told Mayor Lopez that he was still “broken up” over the incident. It is unclear if that victim survived. Witness Suzy Bermudez told ABC News that she and others were able to pull one woman out of the wreckage because her car was only smashed in the rear. Bermudez was sitting in traffic when she saw the bridge collapse, beginning from the left side and then toward the middle. One of the cars she saw was smashed so badly that its lights were almost hitting the ground, Bermudez said. At least six people have died and several were injured as the result of the collapse, which crushed several cars under the debris. Five people were pronounced dead at the scene, and one person died at the hospital, officials said. Search and rescue efforts have not become recovery efforts, officials said, adding that they do not expect to find any more survivors. More than 100 firefighters tended to the scene, sifting through the debris and massive pieces of concrete with the help of canines and cranes. BREAKING: Several deaths were reported after a newly-installed pedestrian bridge at Florida International University collapsed, Florida Highway Patrol told Fox News. The bridge, which was just erected on Saturday and was expected to open in January 2019, was built to make the crossing at the busy intersection at 109th street and Southwest 8th street safer after a Florida International University student died last year while crossing the street, officials said. The pedestrian bridge was intended to connect the FIU campus to the City of Sweetwater. FIU students and faculty had long been clamoring for the bridge, complaining of the hazards in crossing the seven-lane road, the Miami Herald reported. In a tweet Thursday, Florida Gov. Rick Scott vowed to hold those responsible for the collapse accountable. I’ve reached out to officials in Miami-Dade County to offer every state resource to assist with response to this tragedy.